Soils are playing a central role in the transfer and accumulation of anthropogenic pollutants in urbanized regions. Hence, this study aimed at examining the contamination levels of selected soils collected within and around the Paris conurbation (France). This also evaluated factors controlling contamination. Twenty-three trace and major elements as well as 82 organic micropollutants including polycyclic aromatic hydrocarbons (PAHs), polychlorinated biphenyls (PCBs), phthalates (PAEs), polybrominated diphenyl ethers (PBDEs), alkylphenols (APs), and perfluoroalkylated substances (PFASs) were analyzed. 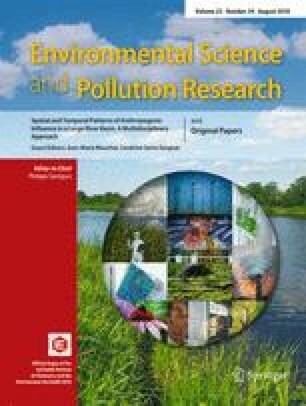 Results reinforced the concern raised by the occurrence and levels of metals such as Zn, Pb, Cu, and Hg, identified as metallic markers of anthropogenic activities, but also pointed out the ubiquitous contamination of soils by organic micropollutants in the 0.2–55,000-μg/kg dw range. For well-documented compounds like PAHs, PCBs, and to a lesser extent PBDEs, contents were in the range of background levels worldwide. The pollutant stock in tested soil was compared to the annual atmospheric input. For PAHs; Pb; and to a lesser extent Zn, Cu, Cd, Hg, Sb, PAEs, and APs, a significant stock was observed, far more important than the recent annual atmospheric fluxes. This resulted from both (i) the persistence of a fraction of pollutants in surface soils and (ii) the cumulative atmospheric inputs over several decades. Regarding PBDEs and PFASs, stronger atmospheric input contributions were observed, thereby highlighting their recent dispersal into the environment. The online version of this article (doi: 10.1007/s11356-016-8005-2) contains supplementary material, which is available to authorized users. This study was carried out within the framework of the PIREN-Seine research program. Authors gratefully acknowledge Tony Nemouthe and Quentin Claveau for the PFAS and metal analyses, respectively.